The best Instant Pot pork taco recipe on the internet. The secret is a whole lot of seasoning cooked into the pork and then finishing the dish under the broiler in your oven. I’m so excited to share this Crispy Instant Pot Pork Taco Recipe with you today because it is a staple in our house. This is the Instant Pot recipe that I make the most often because it’s so easy and so good! We love all things taco/Tex-Mex and I love finding great recipes that are easy to make and get us out of our ground beef taco rut. I love making this Instant Pot pork taco recipe because it is fast. We are talking 4 pounds of meet cooked to shredding perfection in about an hour, start to finish. That’s the perk of using a pressure cooker! But don’t worry friends, if you don’t have an Instant Pot, you can find the slow cooker instructions in the recipe notes. I aim to please! This is a fun recipe because it couldn’t be easier. This is a recipe that practically makes itself, and it lends to the most moist and flavorful meat around. 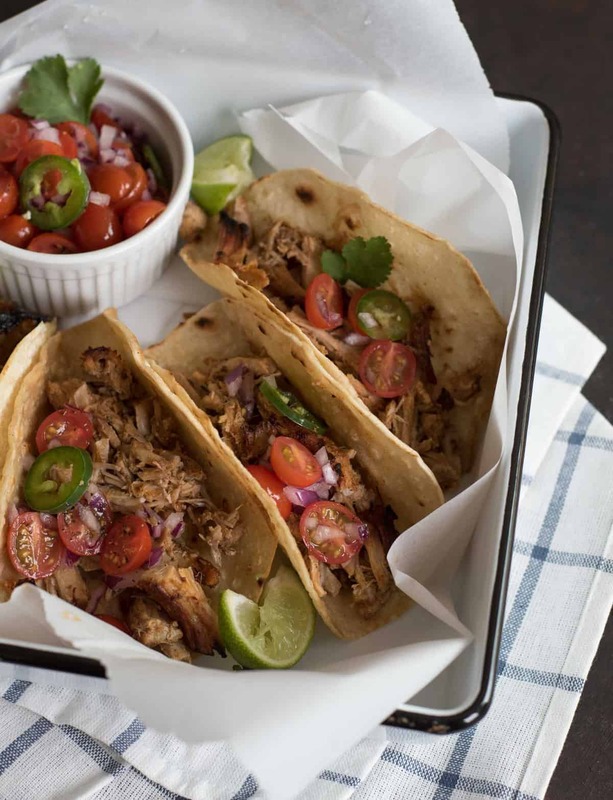 A simple mix of seasoning and spices plus a little stock is all you need to make amazing pork tacos in the instant pot. No special ingredients or trips to the store for this recipe. The other unique aspect of this recipe is that you finish the meat under your oven broiler. You can skip this step of course, the meat is great right out of the Instant Pot, but broiling it reduces the remaining liquid and crisps up the edges of the meat perfectly. 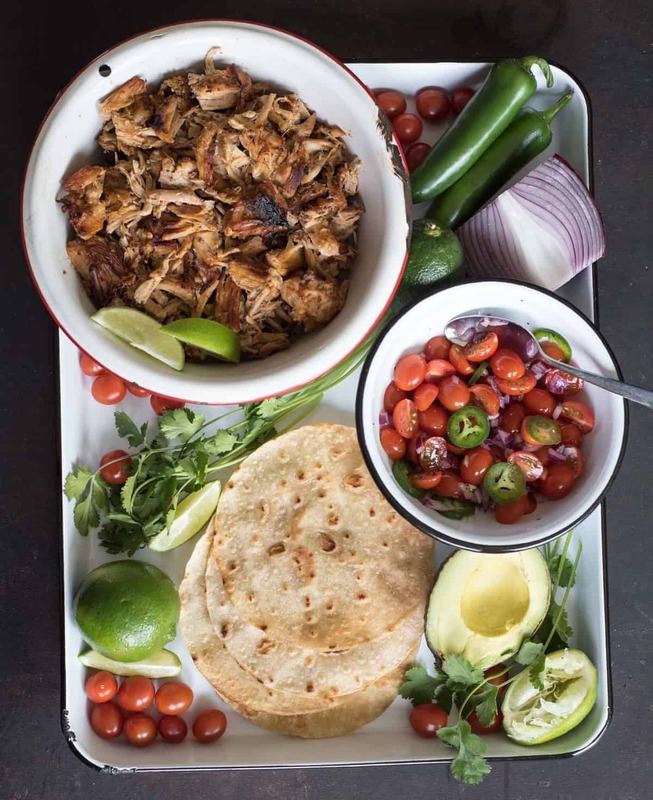 It’s one of my favorite tips for making flavor packed pork carnitas with a great texture. It takes a few extra minutes but I promise it’s worth the time. 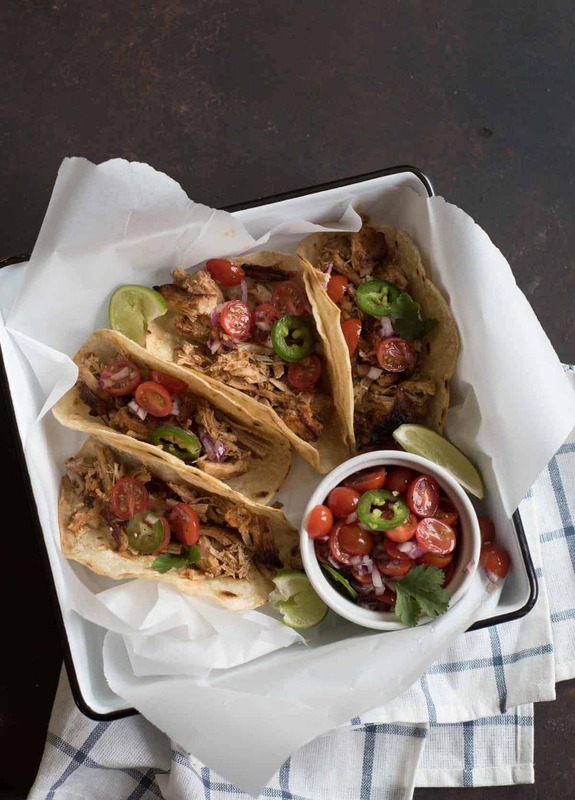 This pork taco recipe is super versatile and you can serve it with just about anything. I like to serve it with a side of Slow Cooker Refried Beans, Easy Spanish Rice in the Rice Cooker, and The Best Blender Salsa Ever. All of these are super easy to make and go great with this recipe. I’ve added some great serving suggestions for the leftover taco meat in the tips and tricks section too. If you are short on time, the pork is great just shredded right out of the Instant Pot. If you skip the broiling step, it just won’t be as crispy. This recipe can be made in the slow cooker by following the same directions (except in a slow cooker) and then cooking it on low for 8-9 hours and then shred and broil as directed. I bought a big 8 quart Instant Pot on Black Friday and I haven’t looked back. Do you have one yet?! I’m on team get-the-big-one because it’s always easier to have more room than not enough. Cutting the pork into chunks is a great trick when it comes to the Instant Pot. It reduces the cooking time needed to cook the pork and it also makes it easier to shred after it’s cooked. It also allows more of the seasoning to come into contact with more of the meat. 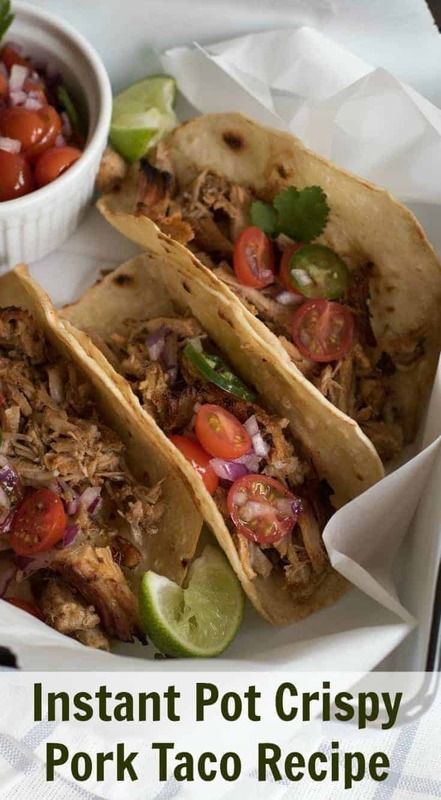 There are so many great ways to use this Instant Pot Pork Taco Recipe. The first night I normally serve it like traditional tacos with all the toppings, but I always have leftovers. To reinvent the leftovers I’ll turn the taco meat into easy oven baked tostadas, easy smothered enchiladas, or Healthy Whole Grain Tamale Pie (just replace the meat called for in the recipes with the already cooked pork taco meat!). In a small bowl, mix together the chili powder, smoked paprika, garlic powder, onion powder, cumin, salt, and black pepper. Place your cubed pork in the bottom of your Instant Pot insert. Sprinkle the seasoning mix over the top of the pork. Use tongs to lightly toss the pork so that the seasoning coats all sides. Add the oil and broth to the pork without letting it “wash off” the seasoning (I just pour it to one side of the bowl). Place the lid on the Instant Pot and set the valve to sealing. Press the pressure cook option, choose high pressure, and then set the time for 30 minutes. When the cooking time has passed, let the pressure naturally release for 10-15 minutes and then flip the valve to venting to release any extra pressure and remove the lid. Use two forks to shred the pork. 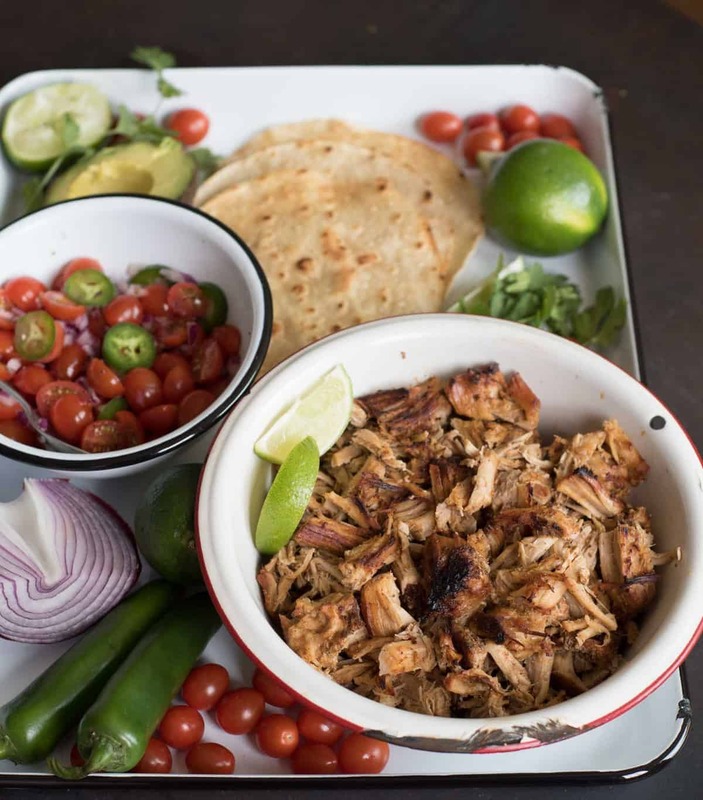 Place the shredded pork and all of the juices remaining in the pot on a rimmed baking sheet. Broil until the top edges of the pork start to crisp and most of the liquid has evaporated, about 10 minutes. Adjust the salt to taste – I always end up adding more. 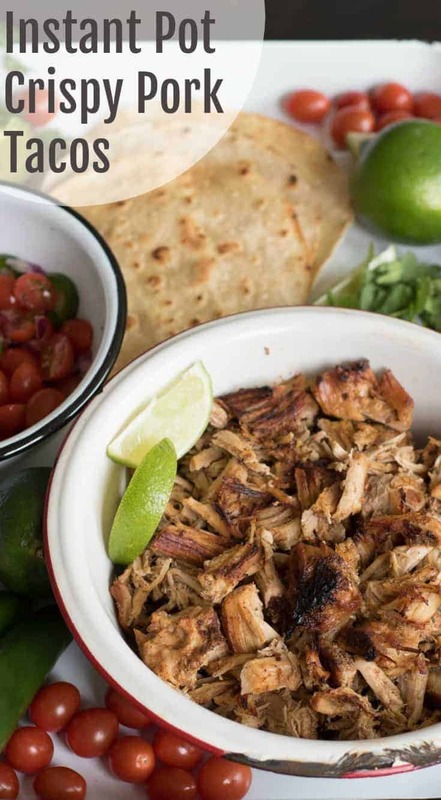 Serve the crispy pork taco meat as you do other taco meats, in tacos, salads, or burritos. This recipe can be made in the slow cooker by following the same instructions. Cook on low for 8-9 hours and then shred and broil as directed. You can cook the pork up to 45 minutes and let it naturally release pressure for as long as you like (if you want to just let it sit in there until dinner, you are fine to make it a few hours ahead of time). 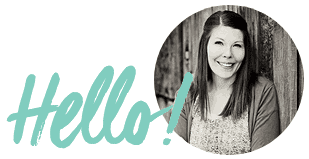 Need a few more Instant Pot recipes in your life? 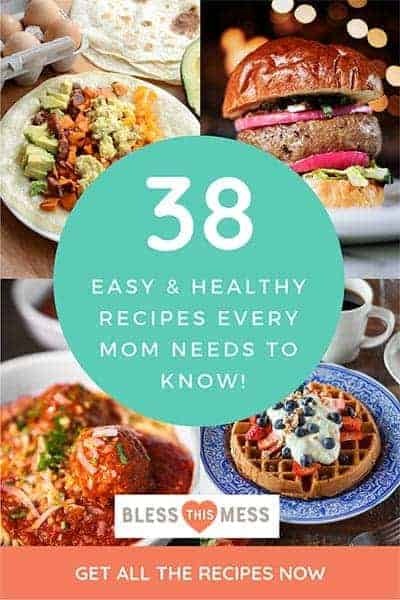 Some of my favorites include Instant Pot Split Pea Soup, The Best Instant Pot Broccoli and Cheese Soup, Instant Pot Vegetarian Chili, and Instant Pot or Slow Cooker Cajun Beans and Rice. It also has changed my boiled egg game! Fresh eggs used to be a nightmare to peel and when they are pressure cooked, the peel comes right off. It is awesome. What do you love to make in yours? Have you bought one yet? 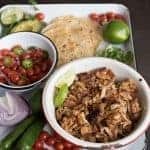 Instant Pot or not, enjoy this awesome Easy Crispy Instant Pot Pork Taco Recipe from my kitchen to yours!